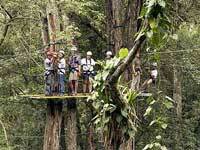 Fly like the birds through the jungle North of Puerto Vallarta, gliding from platform to platform with ease. Flying 90 feet over the forest floor, you'll be eye-to-eye with tropical birds as you swoop down to the next platform. 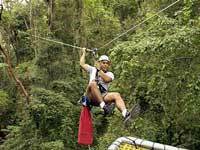 See a canopy tour map. Runs: 3 times daily, at 8:30AM, 11:00AM, and 1:30PM from Marina Vallarta, or 8:00AM, 10:30AM, and 1:00PM from Nuevo Vallarta. Includes: Equipment, Helmets, Unlimited non-alcoholic drinks, snacks. Fanny Pack, strap, or pockets to put Camera in - you can't hold it while gliding. Cash for lunch, souvenirs, including videos available for purchase. Light rain gear during rainy season - it might not rain, but the jungle could likely be wet. Departs From: Vallarta Adventures Offices in Nuevo Vallarta and Marina Vallarta. Directions will be provided with your confirmation. Restrictions: Maximum weight is 250 lbs. (115 kg). Do not drink too much alcohol before this tour - you won't be allowed to go for safety reasons. Kids: 8 years and older. Kids must be over 4 feet (122 cm) tall. THIS TOUR IS NOT AVAILABLE, BUT WE DO HAVE ALL THE VERY BEST CANOPY TOURS IN PUERTO VALLARTA - THEY ARE ALL BETTER THAN THIS ONE! Note: Please type your choice of lunches into the special instructions box when booking. OUR ADVICE: This tour is from platforms well above the ground. If this sounds too scary for you, then think about the Los Veranos Tour. Professional and well-run.